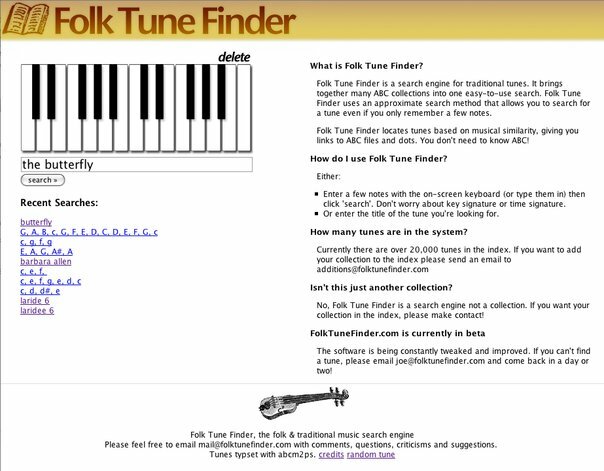 This page details the changes to the software that runs FolkTuneFinder.com. It probably isn't of interest to you, but if you had a problem with the site, and emailed, you can see when it was fixed. 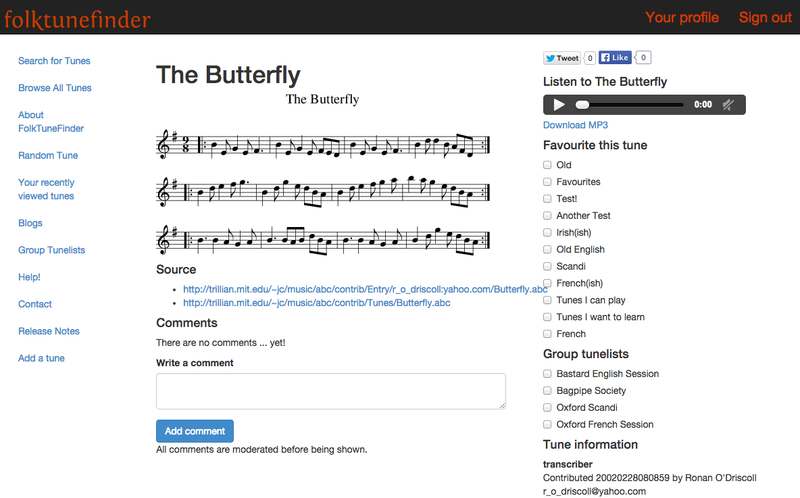 Transcriptions are now grouped into tunes. Transcriptions are compared for melodic similarity. Very similar ones are treated a the same tune. 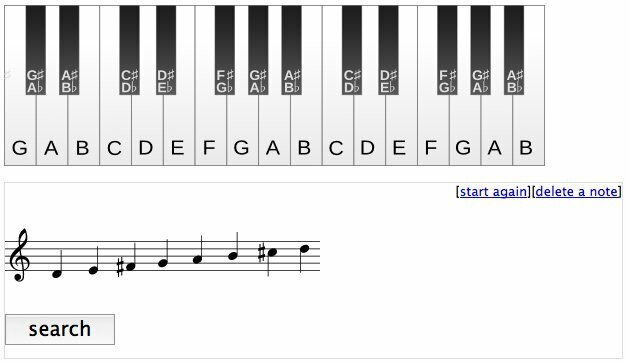 Only one transcription per tune shows up in search results. 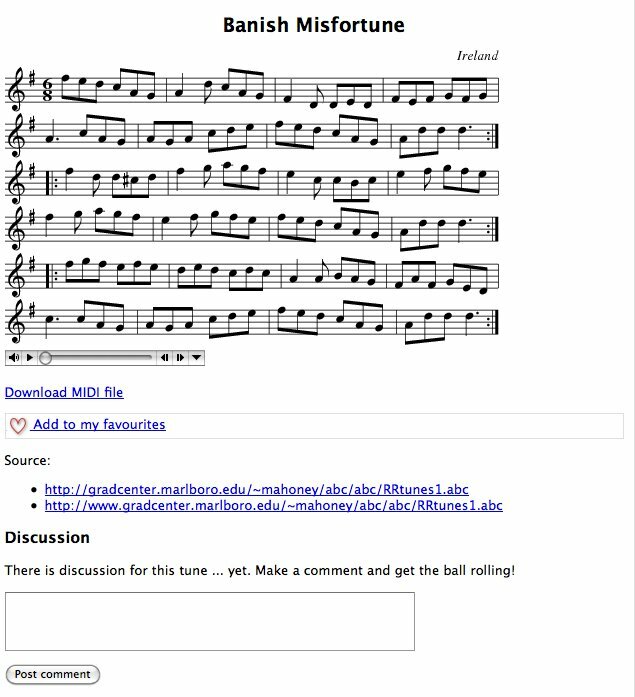 When viewing a tune, all transcriptions shown. Titles for all transcriptions are shown. Means that some tunes known under different names now show up on the same page. Text notes for all transcriptions shown on the same page. 'Features' are a new thing. Analysis for various characteristics of tunes. Browse all features by clicking 'Tune features'. 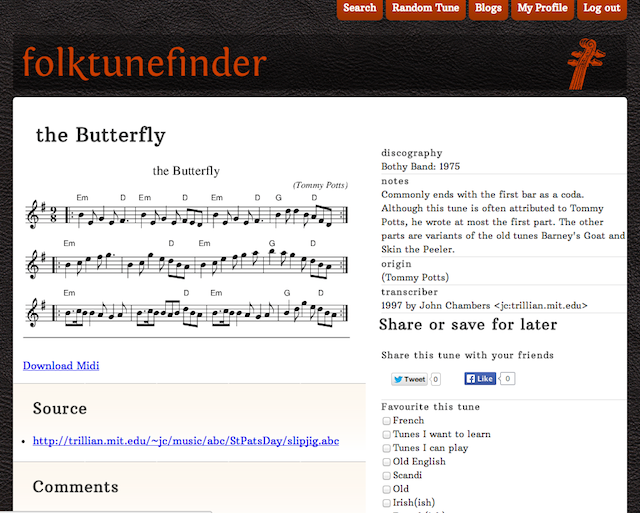 See feature coverage to see how widely that feature is found in the tune database. Build search from features, list tunes that match. 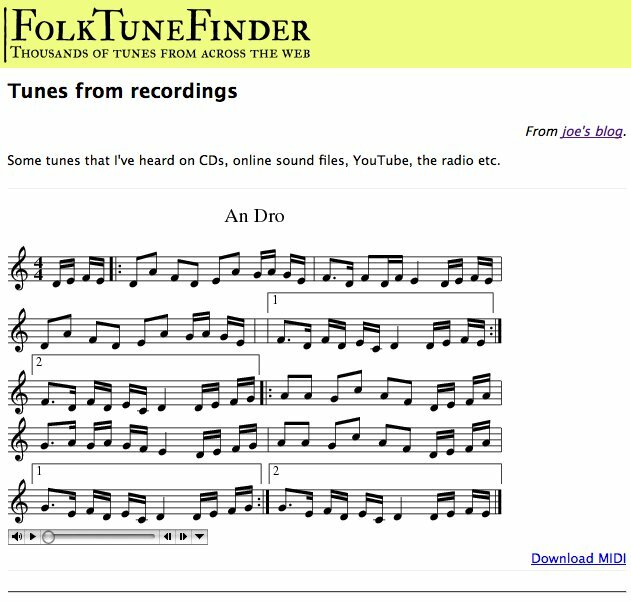 Features shown on each tune page to allow finding other simialar tunes. When doing a search, refine based on features. Complete rewrite. Not a drop of old stuff. Rhythm: As indicated in the ABC header. Link: Is there a link in the ABC? To a webpage, or the ABC, sound file etc. Titles: How many titles? Some tunes have lots of different titles. Movement: Experimental. How much does the melody move about? Key: What key is the tune in? Text: Are there any text notes in the transcription? Accompaniment chords: Guitar or other accompaniment chords included? Your idea here? Write to me! 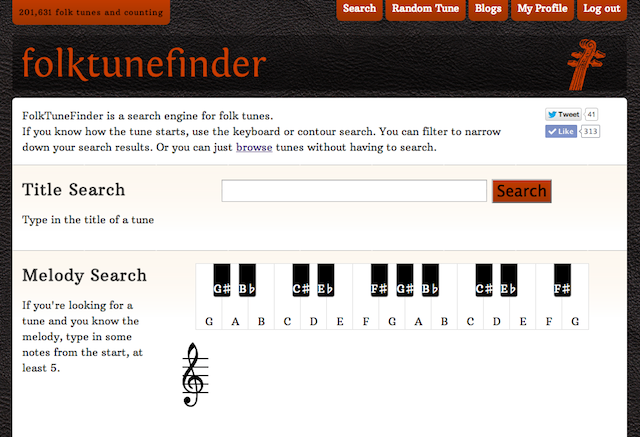 Title search and melody search overhauled. 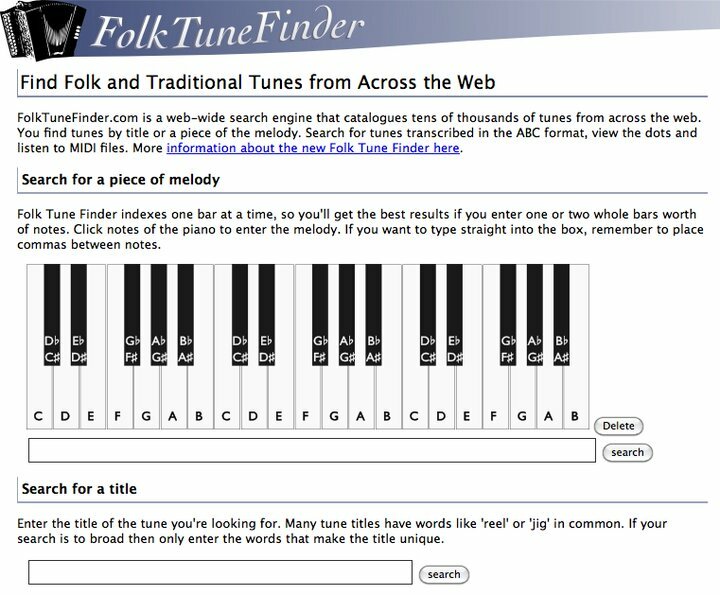 Melody search much more flexible with approximate matches and mistakes. Title search more flexible with spelling variations and international spelling. Browse all tunes by features. Refine search by features (facet). Full ABC now shown on tune page. Better handling of international characters. New responsive HTML design. Should work better on mobile. Keyboard search rewritten, should work better on mobile. 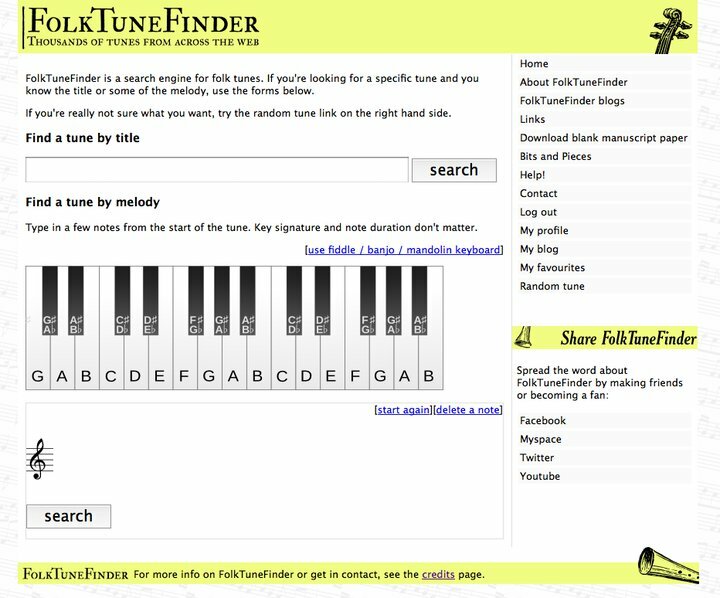 Folk tune finder blogs are taking a temporary leave of absence but will be back! 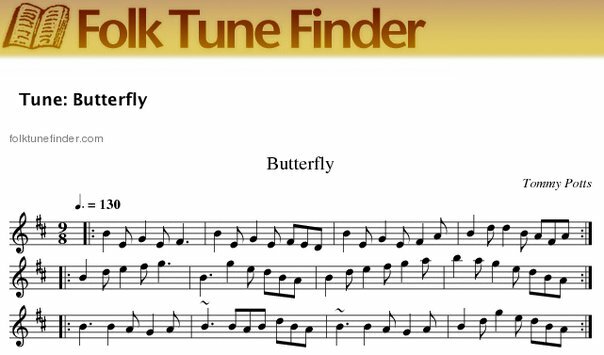 Caching on melody search results, making navigation backward and forward between results and tunes quicker. Limited melody results to 200 tunes. More than that isn't really useful. Fix regression in keyboard which was causing issues with iPads. 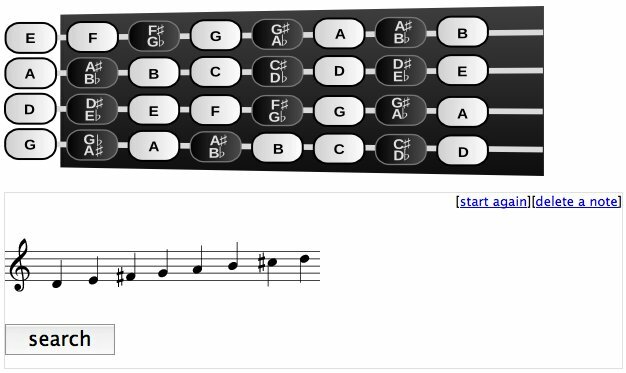 Changed keyboard range to C-below-middle-C to C-two-octaves-above-middle-C, for use by fiddlers and for usibility. Fixed social media buttons on tunes, which were a bit hidden. Put back link to MIDI under 'extras', which may be of use to some. Thanks to FWF for keyboard range feedback, RC for the social media buttons feedback, AR for MIDI feedback. New look! Should be more tablet and phone friendly. Remembers the tune you were typing on the keyboard when you click 'back'. Replaced MIDIs (which new versions of browsers broke) with MP3s. Hosted on new faster server. Browse your recently viewed tunes. Random tune of the day, including past days. Search by interval histogram similarity. Allows searching anywhere in the tune. Allows for approximate matches. You can make mistakes or search for variations. Cuts down duplicates by around 50%. There are still duplicate tunes, and always will be. Tells where in the tune the search result occurred. Matches at the start of the tune are prioritised. Login is via Mozilla Persona. Log in with the email address you provided when you signed up. Your username will be used to identify you on the site, as before. If you set a 'full name', that will be used instead. Contour / Parsons code search (sorry!). Fixed bug in melody search results. Filters were not being carried through to next page. 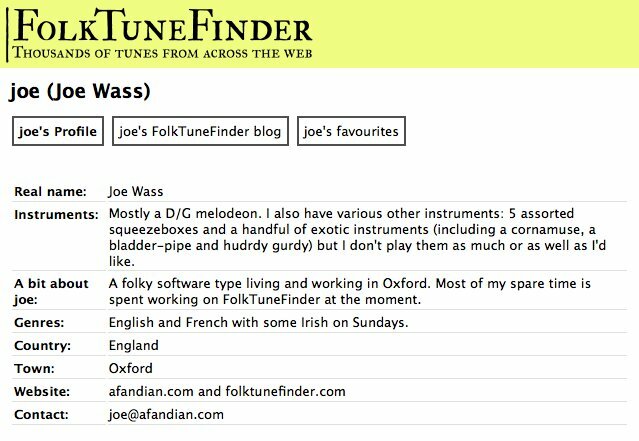 Now you can browse and filter tunes without searching. Browse button on front page. Filtering based on pitch content and instrument suitability. D/G Melodeon, B-flat, C, D, F whistle, G and D pipes filters for starters. Fixed form on title pages. Filtering based on time signature! At last! Filtering based on key signature! 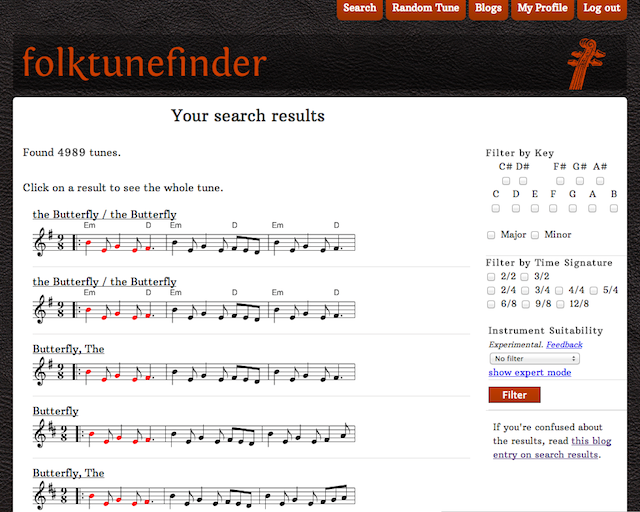 Structural change in melody search engine (retrieval of titles). 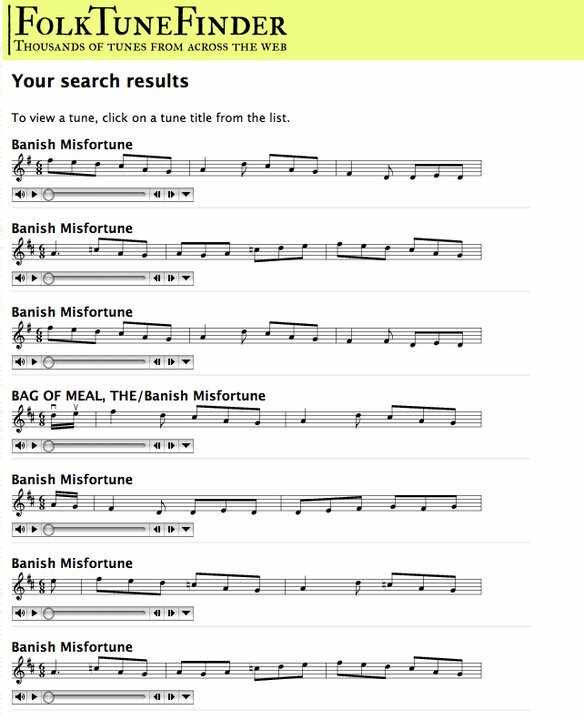 Search melody results should be a little faster. Number of pages shown at the end of a melody search. Ability to change your own password. Stability fixes (tweaks to Redis). Complete re-design of melody search system. Search system now more exact. Search and indexing now written in Go. Recently viewed tunes, popular tunes, recent search results link on home page. Changes to caching on the server. Incorrect username on blog posts fixed. Tweaks to make it easier to start a blog. More aggressive spam filtering for blogs. The return of MIDIs! These were only delayed due to a technical hitch. Link to MIDI file under tune. Some fixes in response to the first few days. Starter help page, more content to follow. Links to search help on search page. Facebook and Twitter image links. Fixed some bugs around profile links. Blog view source (for tutorial). Blog edit help and instructions. Melody search implemented in Redis and Python. Old C code banished. Written in Python only, using Postgres, Django and Redis. Written in Python and C, using Postgres and Django. Written in Java and PHP with MySQL.